Interested in hacking your way through college? Or at least saving money in some very unique and very smart ways? Who isn’t? As a college student you need to be stretching your dollars as far as they can go. So you can put your money toward more important things . . . like tuition. If you’re ready to supercharge your savings, here are some of the absolute best money-saving hacks for college students. Use LOZO.com for Big Grocery Savings! Want to save some serious dough on your groceries? Go to LOZO.com, type in your grocery list, and LOZO will find coupons to go with your list. They’ll search across 400 coupon sites and email you the links to printable coupons that’ll help you save. Get Amazon Prime for Free! Amazon Prime is awesome. It’s seriously one of my favorite money-saving websites around. With Prime you not only get free two-day shipping, but you’ll also get access to exclusive student promotions. Plus, you get a $10 credit every time you refer a friend. Students get their first 6 months of Amazon for free and then get a 50 percent discount after that. If you opt to sign up after your first six months, you’ll then get access to a library of free movies and TV shows and will have the ability to check out one free Kindle Prime book per month. Can’t afford Microsoft Office at the moment? No problem. You can download OpenOffice instead. OpenOffice has many (if not all) of the same programs as Microsoft Word, except it’s completely free. As you know, it’s important to start working on your finances while you’re in college. Stay on top of your credit score and make sure you’re getting the interest rates you deserve. You can sign up at a place like Credit Karma to get a 100% free credit score. College students have a tight budget and there’s no need to be paying an arm and a leg for phone service. You can instead ditch your contract phone and check out Republic Wireless. Republic Wireless is a cell phone service that works off of a combination of towers and Wi-Fi. Best of all, their plans start at $5 per month. Don’t worry, they offer smartphones, just at a much more affordable price! Between studying, working, and having a social life, tracking your finances can often lose priority. With Mint.com you can link up your bank accounts and credit cards and have your spending tracked for you. Just log in to your account every week or so and you can see a snapshot of your spending! Do you ever go to the bar intending to spend $20 but realize that you wasted about $80 the next morning? If your answer is yes, you need to give yourself a drinking allowance. Only take a $20 bill with you when you go out drinking. If you don’t have money on you, then you can’t spend it! If you’re planning on shopping at a popular retail store in the next couple of weeks, do your research first. You can use a site like Gift Card Granny to buy gift cards for up to 25% off! That’s some easy savings too good to pass up. Sorry fellas, this tip is just for the ladies! When you get the urge to buy yourself a new outfit, stay out of the mall. Visit an online consignment shop like thredUP.com or LikeTwice.com to do your shopping. Both of these consignment shops only accept clothing in exceptional condition and only sell high-quality, name brands. I started shopping at thredUP a year ago and I’m in love. The clothes are super affordable and have such a high quality to them. Once you give them a try, you won’t want to go back to the mall. Need a scientific calculator? Have a smartphone? Just download the RealCalc app and you’re good to go! You can use StudentUniverse to not only find exclusive student discounts, but to also score cash back. Simply visit their website, search for the item you’re looking for, and they’ll let you know if you can get a discount. With a little creativity and a tiny dash of effort, you can save yourself some serious cash with these money-saving hacks. Let’s grow this list. 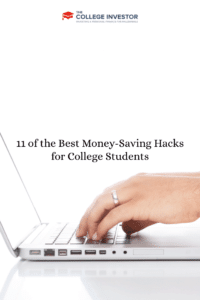 What other money-saving hacks are perfect for college students? This is great! Thank you, Alexa! Thank you so much! My first semester has been CRAZY tight on money…but hey, NO STUDENT LOANS! !